Competition - Absolut Grapefruit Competition WINNERS! Aurora's Embrace is bright and savory w/ elements of winter herb and spice embracing the cocktail. Aurora is the god of winter dawn. The name pays homage to the amazing winter skies that we have here in San Diego. Aurora's Embrace is playful yet complex. The perfect go to for the holidays. Inspiration: "I was inspired by the flavors of winter. I wanted to showcase what winter has to offer that wasn't a berry or succulent melon. Persimmon was the perfect candidate and it paired so well with the Grapefruit Absolut. The Rosemary and the Clove add another level of depth and does a fantastic supporting role for the over all flavor cocktail." Combine all ingredients into a shaker with ice. Shake and double strain into a cold coupe glass. Garnish with a dehydrating persimmon with a rosemary sprig going through the center. 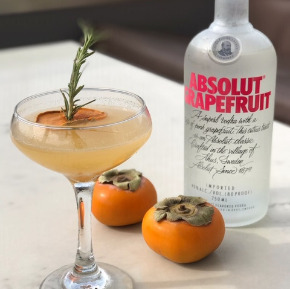 Congratulations to Erik Frank for winning our Absolut Grapefruit Competition, to Brian Means and Philip Cacciatore for finishing up as runner-ups, and thank you to all members for participating!